Many times, while searching information that interests me on the Internet, I see that what is more interesting, are the comments that accompany the articles or the opinion of the author. I also note that the more I read them the more I forget the original text, which was after all the main reason that attracted me to read them. The same thing happened to me recently when I was reading about an event that was going to take place and had as a subject the citizenship of second generation immigrant children. In the comments accompanying the text there were 1 or 2 positive ones and that’s it. Then one after the other followed comments incredibly aggressive, offensive, racist. Comments full of hatred, without argument, which aimed only to offend and let out madness. The first thought that came in my mind was how can you live with so much hatred inside you; is it not directed against yourself too? And then I felt, after the rage, surprisingly, sadness. Sadness for what you lose by being constantly negative, messing with others, but in fact destroying yourself and more specifically, your creative part. In that way, in discussions I make for the second generation, there are many who wonder “oh really they do not have citizenship? Neither a residence permit? But how is that possible?” And from this point, my dear friends, we enter on legal grounds. For births and nationality of the infant, the blood theory (nationality of your parents) rather than the place (ie where you were born) takes the lead. In other words, if one of two parents is not Greek, nor his children are. And that’s the stage where the delirium begins. It is not that Greece had never anticipated for such issues or has a comprehensive immigration policy, which will not change depending on who governs. But my purpose is not to make a legal analysis and general recommendations on the matter. The cause that made me start writing is hate speech, the racist discourse. And particularly on the Internet. The Internet, as you surely know, is a privileged place for young people. It is a piece of cake for them to use and especially the social media. It is another socialization space for them. And as in any other field, there everyone fits, the good and the bad. And as it is used by human rights defenders, it is equally used by their enemies. 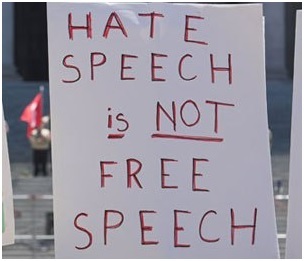 Hate speech is cultivated especially online. Internet makes it easier because 1) there is anonymity, 2) anyone can write anything without evidence, 3) all kinds of conspiracy theories flourish, 4) violence (aided by anonymity) is immediate and 5) there is a massive mobilization against a target. Up to today, there is no reliable data and the impact of hate speech cannot be measured as it is expressed on the Internet. And of course this has nothing to do with freedom of speech and expression. I can disagree with someone, but I accept this in the context of dialogue and calm confrontation. I cannot certainly accept it when someone is screaming-even by writing – tossing words having memorized beforehand, having no purpose to disagree but to cover up any other voice. Remember that: cans make the most noise when they are empty. You much have noticed how quickly particularly radical right / fascist / racist groups react in any post they don’t like: They act instantly. It is like they are waiting to attack. The attack is usually swearing, insulting, threatening with no well-documented opinions. Sometimes you “see” them spitting because of their rage. And that, in any case, is not freedom of speech. It’s brute violence. And what do we do? We are present and act calmly without forgetting the risks hidden in the Internet. And we are also present in the real world because only knowing other people, those who are called different, we can understand them and effectively defend our views. Solidarity is the key word, we urgently need to find a way to tackle racism through self-organization and self-protection. Another thing we also need is knowledge on what we support. It may seem that those who bray is a brainless mass, but my personal opinion is that they are driven by people with distorted views, although updated and widely informed on racist theories, good orators and therefore dangerous. On March 21, 2013 the Council of Europe Youth sector launched the annual campaign entitled «Young People Combating Hate Speech Online». This action aims to combat racism and discrimination expressed by hate speech on the internet, “educating” young people and youth organizations with the necessary tools to recognize and block this kind of hate acts. Of course the campaign makes it clear that is not intended to limit the freedom of speech on the internet. And as mentioned by friends activists from Holland, “the sunshine of the antidiscrimination movement is needed to block the black horizon created by a golden dawn”.